Turning The Tables Listening Party: A Dynamic Sister Duo : World Cafe A discussion of two of the most powerful women to shape cultural conversations in recent years, Beyoncé and Solange. In July, NPR published Turning The Tables, a list of the 150 Greatest Albums By Women released during the "classic album era," defined as 1964-2016. Our occasional listening parties bring together voters to discuss some of their favorites from the list. Today, we look at two of the most powerful women to have shaped cultural conversation in recent years, Beyoncé and Solange. 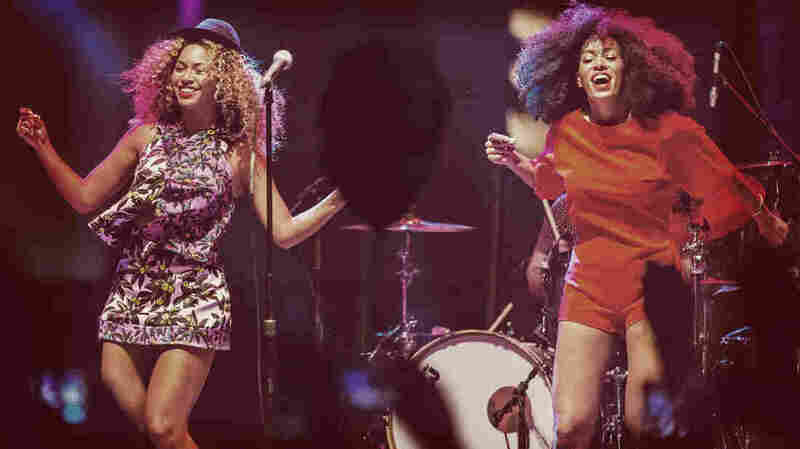 The Knowles sisters both released albums in 2016, and it was these two discs, Lemonade and A Seat at the Table respectively, that convinced the Turning the Tables staff to extend the cutoff for eligibility (originally 2014) into that year. In this episode, critic Ann Powers, who spearheaded Turning The Tables, is joined by a trio of NPR Music commentators: Marissa Lorusso, Katie Presley and Sidney Madden. They discuss these two career-changing and culture-defining records and explain why so many felt that no list of the 150 greatest albums by women could be complete without these groundbreaking works. Hear our discussion in the player above.